In the Biblical Book of Isaiah, the prophet provides us with a divinely inspired prediction of the effect the holy Infant was to have on Egypt and the Egyptians: "Behold the Lord rides on a swift cloud, and will come into Egypt and the idols of Egypt will totter at His Presence and the heart of Egypt will melt in the midst of it". 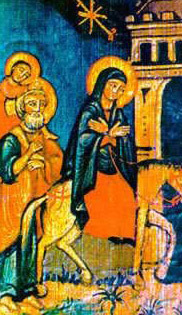 (Isaiah 19:1) (Left: An icon of St. Demiana - The Church of Abu Sefein, Old Cairo) The authority of Old Testament prophecy, which portended the crumbling of idols wherever Jesus went, further foreshadowed the singular blessing to be bestowed upon Egypt, for its having been chosen as the Holy Family's haven, and upon its people for having been the first to experience the Christ's miraculous influence. According to the traditions of the Coptic Church, 'the altar' mentioned is that of the Church of Virgin Mary in Al-Muharraq Monastery, a site where the Holy Family settled for a period of more than six months; and the altar-stone was the 'bed' upon which the Infant Saviour lay. Al Muharraq Monastery is located, literally, "in the midst of the land of Egypt"standing at its exact geographical center. As for the "pillar at its borders which will be for a sign and for a witness.." surely there can be no more demonstrable, concrete proof of the fulfillment of the prophecy than that the Patriarchal See of the Apostolic Church in Egypt, established by St Mark himself, is situated in Alexandria, on Egypt's northern borders. But the prophecy, knitting a perfect pattern of things to come, does not stop there. It continues, "Then the Lord will be known to Egypt, and the Egyptians will know the Lord in that day and will make sacrifices and offering". (Isaiah 19:21). As Christianity in Egypt spread, churches were built throughout the length and breadth of the land, and the sites chosen were, primarily, those which had been visited and blessed by the Holy Family's sojourns. The New Testament records the fulfillment of these Old Testament prophecies as they unfold in their historical sequence. "behold, an angel of the Lord appeared to Joseph in a dream, saying, Arise, take the young Child and His mother, flee to Egypt, and stay there until I bring you word, for Herod will seek the young Child to destroy Him". (Matthew 2:13) Joseph complied. A donkey was fetched for the gently Mother, still so young in years, to ride with her new-born Child in Her arms. And so they set out from Bethlehem on their pre-destined journey, the hardened old carpenter, who was Mary's betrothed, striding ahead, leading the donkey by its leash into the untracked paths of a wilderness dark as the desert nights, and unending as the months of never ending horizons. Such an arduous journey it was, fraught with hazard every step of the way. In those far-off days, there were three routes which could be followed by travelers traversing Sinai from Palestine to Egypt, a crossing which was usually undertaken in groups, for without the protection of well-organized caravans, the ever-present dangers even along these known and trodden paths were ominously forbidding. But, in their escape from the infanticidal fury of King Herod, the Holy Family understandably had to avoid the beaten tracks altogether, and to pursue unknown paths, guided by God and His Angel. They picked their way, day after day, through hidden valleys and across uncharted plateaus in the (then) rugged wastelands of Sinai, enduring the scorching heat of the sun by day and the bitter cold of the desert nights, preserved from the threat of wild beasts and savage tribesmen, their daily sustenance miraculously provided, the all-too-human fears of the young Mother for her Infant allayed by the faith that infused her with His birth. And so they arrived, at last, safely, for God had pre-ordained that Egypt should be the refuge for the One who was to bring the message of peace and love to mankind. The tortuous trails they followed in their passage across Sinai, and their subsequent travels within Egypt, are chronicled by Pope Theophilus, 23rd Patriarch of Alexandria (384-412 AD). He testifies, in his celebrated annals that on the eve of the 6th of Hathor (the Coptic month corresponding roughly with November), after long prayer, the Holy Virgin revealed herself to him and, after relating the details of the Holy Family's journey to, in, and from Egypt, bade him record what he had seen and heard. It is a source which no Christian believer would question. 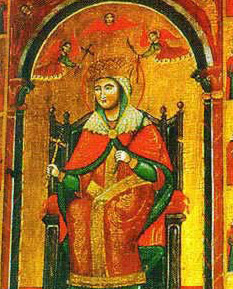 Besides, it is a virtual certainty that, at a time when happenings of a momentous or historical nature were transmitted by word of mouth from one generation to the next, the account of Pope Theophilus' vision confirmed the oral tradition of supernatural occurrences which accompanied the arrival of a wondrous Child in the towns and villages of Egypt some 400 years earlier.